Winter Baking at Home – Breads & Cookies! This long cold snap has kept many of us indoors, giving us time to connect with family, catch up on television, finish books, and watch our favorite football teams (we are picking a second favorite now that the Broncos are out!). This extra time spent indoors also gives us the opportunity to explore more in our own kitchens. The perfect compliment to long cozy days indoors are the aromas of fresh bread baking, cookies warm from the oven, or cooling cupcakes waiting to be decorated. Whether you are perfecting a family recipe or trying something new, these cold winter months are the ideal time to test them out! The nostalgic favorites will always be chocolate chip and oatmeal raisin. This year’s trendy cookies include French macaroons and whoopie pies. 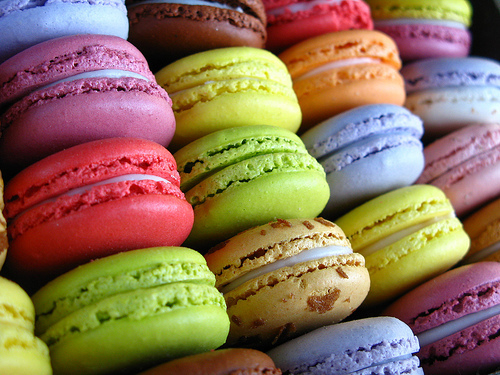 The macaroons can be brightly colored to cheer up the dreary weather and whoopie pies are kind of like a soft stuffed cookie that can be filled with a variety of flavors. For anyone baking cookies at home, experts recommend a good layered cooling rack–this way you won’t have to over crowd when cookies are cooling this can cause them over-steam themselves and stick together. Another fun (though not necessary) gadget is a cookie press. Cookie presses allow cookies to come out uniform in shape and will keep your hands out of the dough! For those of us who like dough sampling, use a small ice cream scoop. Another essential to cookie baking is the Silpat. This is a product that professionals have known about for a long time. Silpats are used in place of parchment paper; they are made of non-stick silicone and make for even baking and easy clean up. Colorado’s high altitude keeps many of us away from bread baking. However with a few simple tools and tricks it is v ery do-able. 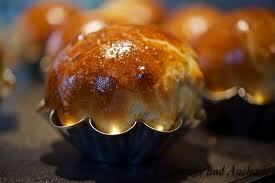 Breads can be very easy, such as a simple French loaf, or more complex, like a brioche. A bread machine is not needed, nor is tons of time. With only a few pantry ingredients (flour, sugar, yeast, and, water) your kitchen can crank out bread to rival your local bakery. A bench scraper is the tool bread bakers use to divide dough and assists when kneading. This tool makes it easy to separate your dough in half, as most bread recipes make two loaves–which brings us to another essential: two standard sized loaf pans. A baking stone is also a must have as bread can be baked directly on it or in loaf pans. It is the best way for a home baker to achieve the tastes and texture of a hearth oven. For high altitude bread baking, start by looking at the yeast. Be sure that the one you use is instant active dry yeast and not the rapid rise kind, and decrease the amount of yeast called for by one forth. High altitude breads typically rise faster, which can be a plus! 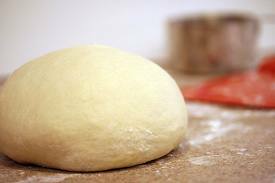 Punch the dough down after the first rise and let the dough rise again until it has doubled. Be careful not to let the dough over rise as this may cause an unmanageable bread monster! Of course, if you are impatient and do not want to fuss with all the bread baking techniques there are the easy-to-bake quick breads, like banana breads or blueberry muffins. Anything But Vanilla Accent your wedding, party, or special event with art you can eat! Eco-Beautiful Weddings Eco-Beautiful Weddings is the first and only quarterly online magazine and daily blog dedicated to eco-friendly weddings. Living the Sweet Life A FULL SERVICE BAKERY AND SWEET SHOPPE FEATURING CUPCAKES, CAKES, PIES, BARS, COOKIES, BREAKFAST TREATS, AND AN OLD-FASHIONED CANDY BAR. Peters Photography We’ve had the pleasure of serving over 500 metro-area families; we’re also the official school portrait photographer for Aspen Academy. Corporate clients include Advocates for Children, Colorado School of Mines, and Serendipity Catering. Plum Sage Flowers Plum Sage can create stunning flower arrangements for weddings, holidays, special events, weekly or everyday occasions. Professional DJ Services Professional DJ Services offers affordable, high quality mobile DJ solutions tailored to meet your needs. Specializing in Weddings, Parties, and Special Occasions.